Whether you believe in them or not, the legends surrounding tress and plants contain powerful images which appeal to us because of their humanity and sheer simplicity. God employed a burning bush as a medium of revelation when He spoke to Moses, and every tree or plant on this planet is afire with His presence. for example, in the plant realm, the cornflower has ultraviolet pigments in its blue petals, which are invisible to the human eye, but irresistible to a pollinating bee. In the realm of trees, the seed of the maple is equipped with a neat pair of wings, which enables it to sail away from the parent on a current of air. Jesus used trees and plants as metaphors, and early monks and missionaries took up the torch, relabeling a number of trees and plants with holy names as an educational tool. In this book, I have sought to rescue some of these legends from obscurity, concentrating on those within the Judeo-Christian tradition: in a few instances I have taken the liberty of linking biblical references to botanical names. It is my hope that this collection, with its beautiful photographs and simple text, will reach a wide readership, to inform, inspire, and entertain. 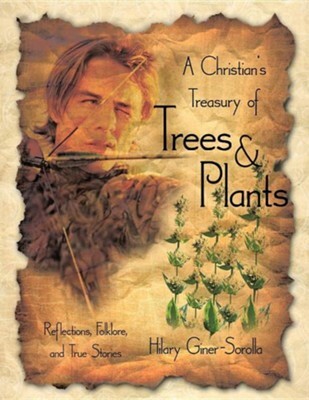 I'm the author/artist and I want to review A Christian's Treasury of Trees & Plants.